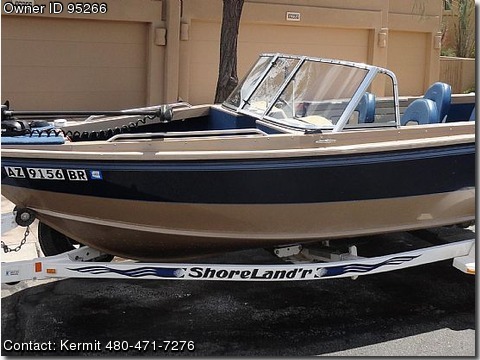 Call Boat Owner Kermit 480-471-7276 480-261-3093. Basic Decription: Great Condition 1997 Lund 1800 Fisherman with 2012 115HP Evinrude ETEC on deluxe swing tongue Shorelander trailer with spare tire. Full canvas top, side curtains, rear curtain and bow cover and custom storage canvas. Electric trolling motor with both electrical and mechanical disconnects. Fish, cruise or ski this boat will do it all. There is a total of five seats. The seats have no tears and still look like new. The new outboard has less than 20 hours. The boat has never seen salt water. I am original owner of all the equipment and have original manuals. Boat was stored indoors for all its life in Minnesota. Recently moved to AZ and we are too busy to go boating. This is a great deal and sure beats the price of buying a new boat.